A “green screen video” is a type of quick edit video which utilizes specialized software to chroma key composite two or more digital images together. 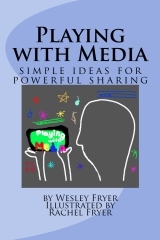 Green screen videos can include static/still images in the background or foreground, and/or video clips. Weather segments on television are a common use situation for green screen videos. Green screen videos allow subjects to “magically transport” themselves to a variety of locations and potentially “report live” from exotic places. 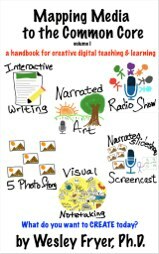 PLAN: Make a storyboard to plan the introduction, main points, and conclusion of your video (just like a written paragraph or essay). Plan what actors/actresses will say AND the desired background. PHOTOS: Take or find and save images to use as background photos. Save each photo to your iPad Camera Roll. 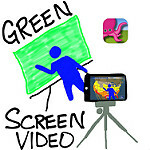 GREEN SCREEN EFFECTS: Use the Green Screen by Do Ink app on an iPad to add background images and/or videos for each scene. Save each scene to your iPad camera roll. COMBINE CLIPS: Use iMovie for iPad to combine your clips/scenes into a single, final video. Export at 720p. SHARE: Use the YouTube Capture for iPad app to upload your final video to YouTube. Green Screen Movie Planning Sheet!